Sneak into the Pact's most exclusive mage's college. 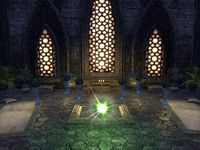 Deshaan's Academy of Magic, Shad Astula, trains only the most promising mages to become leaders of the Ebonheart Pact. However, the Academy only accepts those who've received a special invitation. Travel to Shad Astula and talk to the registrar. 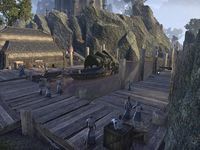 In northeast Mournhold, behind the Dres House, you'll find the city's docks, and a gathering of many people in blue and white robes. They are mages, waiting for their boat ride to Shad Astula, a prestigious academy for future leaders of the Pact. "Tell me, how did your invitation arrive? In the claws of a bird of prey? In the fist of a charmed giant? I got mine from a terrifying ghost!" "What do you mean, what do I mean? Your invitation to attend Shad Astula, of course. Oh, my—you really have no idea what I'm talking about, do you?" Not even the faintest clue. "We're waiting to depart for Shad Astula, the Academy of Magic. The Academy sends invitations to only the most promising mages. Trains them to become leaders for the Houses and the Ebonheart Pact. My apologies, I thought that was common knowledge." Ah. In that case, where do I sign up? "It's not that simple. You have to be invited. No invitation, no boat ride to the island. The Academy is quite exclusive. Not like the Mages Guild." How do I get one of those invitations? "All of us waiting for the boat have invitations, but I doubt you'll find anyone willing to hand one over to you. It's a big honor to be invited. Anyone willing to toss that away isn't really Academy material." Know anyone who might be willing to give up an invitation? "Well, Geirvarda doesn't seem very thrilled about going to the Academy. And Renus and Guronii will wager on anything. I even heard some students buy their way onto the boat, but I'm not sure I believe it." 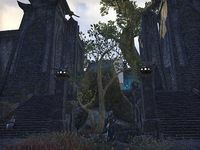 An alternate way to start this quest if you go directly to Shad Astula is by speaking to Instructor Ninla at the front gates. She will direct you back to Mournhold to get an invitation. Renus or Guronii, both of whom can either be intimidated (Intimidating Presence passive from the Fighters Guild skill line) or dueled. If you choose to duel one of them, Renus wields ice magic and Guronii prefers fire. Once you have an invitation, head over to the Boatmaster, the ghost standing on the dock. Show him your credentials and he'll transport you across the lake to Shad Astula. Head up the docks and to the Registrar office, the first building before you actually enter the gates of the school. Talk to Registrar Bameni, and hand over your invitation. She will tell you the Arch-Mage himself has been expecting you. She'll also say there's no need to worry, however; he had a vision about you, as such things are one of his 'many, many gifts'. Exit the office and head up to the compound. It's huge, and swarming with students and instructors. The main building where the Arch-Mage is lies straight ahead, up some steps. Skirt the inner courtyard and enter the Arch-Mage's office. Arch-Mage Valeyn is waiting for you a few steps inside. Speak to him. "I expect my students to strive for excellence. I demand brilliance, determination, and eagerness to embrace the ineffable mysteries of our noble calling." I'm not really a student here. "Do not doubt what was meant to be. Powers beyond our comprehension set things in motion and all we an do is take the ride. I saw you in my visions. You have come to protect the Academy." Protect the Academy? From what? "That part of the vision remains clouded. Nonetheless, here you are and we must get ready. I need to confirm your sensitivity to magic. The lights in the next chamber form a ... test of sorts. Only the most sensitive individuals can see them." "Touch the vision orb behind me. Watch the pattern play out. Simply repeat the order by touching each of the spheres. If you make a mistake, you may start over." In the small room behind him are six dark blue orbs with a watery effect arranged before one bright yellow orb. Activate the yellow orb first, and watch as the other orbs light up one by one. Your task is to memorize the order in which they light up and reproduce it once the sequence finishes. If you were to label the orbs from left to right as 1 though 6, the correct order is 3-5-1-2-4-6. Once you have it, the orbs will disappear, and you have to talk to the Arch-Mage again. "I knew you could do it. Well done! Now to business. Something threatens this Academy, but your presence here will save the day. I have seen it in a vision!" "You've seen it. War and disease ravage our lands. We're surrounded by enemies, yet still we tear at each other's throats. Our students will help change that. And you will keep them safe so they can fulfill their destiny." And how am I doing to do that? "We'll figure that out together. Though the invitation didn't start in your hands, that's where it ended up. You were meant to be here. A great danger approaches this Academy. And you will save u from this disaster. I have foreseen it!" You will receive a leveled amount of gold and experience, and the next quest, School Daze, will be available. The instructor at the Shad Astula Academy of Magic said that I need to have an invitation. She suggested I talk to the boatmaster at the docks so I can return to Mournhold. If I want to visit Shad Astula, I need to acquire an invitation. Maybe I can get an invitation from one of the students waiting along the docks. I acquired an invitation to the Academy. I should speak to the Boatmaster when I'm ready to visit Shad Astula. I arrived at Shad Astula. My invitation says I should report to the Academy's registrar. Somehow, the Arch-Mage knows I arrived at the Academy. He wants to talk to me in the main building. The Arch-Mage needs to make sure I can handle myself around magic. He wants me to go into the next chamber and solve the memory challenge. I need to touch the glowing orb and memorize the sequence. I watched the sequence of the lights. All I have to do now is touch the orbs in the same order. Finishes quest I completed the memory challenge. I should speak to Arch-Mage Valeyn to find out what he wants me to do next. This page was last modified on 1 September 2018, at 06:30.